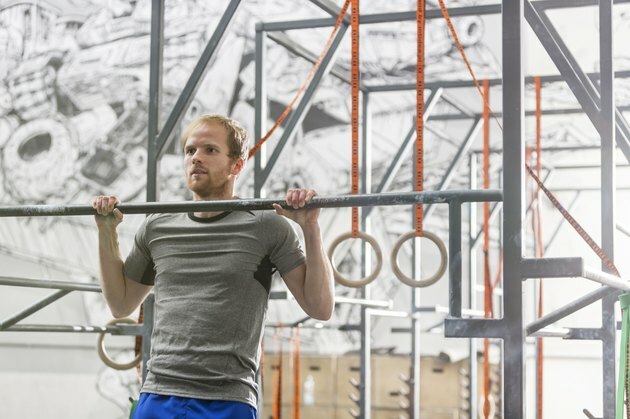 What Are the Benefits of Doing Chin-Ups? Installing a chin-up bar in your home or visiting the calisthenics station at a local park gives you all the equipment you need to perform chin-ups. This challenging body-weight exercise strengthens a number of muscle groups, but the benefits you reap from dedication to chin-ups aren't just visual. Strengthening your muscles can greatly impact your overall health and improve your quality of life. One of the benefits of chin-ups is this exercise's ability to strengthen a significant number of muscles with each rep. Although some strength-training exercises involve just a short list of muscles, chin-ups use more than a dozen muscles. This exercise targets the latissimus dorsi muscles of your back, but also involves a number of muscles in your arms, shoulders and chest, including your posterior deltoids, triceps, biceps and lower and middle trapezius. Strong muscles aren't beneficial just for athletes. You can benefit from strong lats, shoulders and arms during a nearly endless list of everyday activities. Strong lats, for example, help you lift yourself up out of your chair with ease. Strength in your biceps and triceps muscles helps you perform such repeated movements as lifting a bag of groceries or a backpack and pushing a door shut, respectively. Strength-training exercises such as chin-ups offer several benefits that you might not consider as you perform each rep. Strength training protects your body from injury, improves your stamina and elevates your basal metabolic rate. Performing chin-ups can elevate your mood, clear your mind of the day's stresses and, as you build a stronger body, lead to greater self-confidence. As you age, strength training can provide relief from the symptoms of osteoporosis and arthritis. A significant benefit of the chin-up exercise is its versatility. When you're new to this workout, it's often difficult to successfully perform even a single rep. Instead of getting discouraged, however, you can modify the exercise to increase its ease by having a partner hold your lower body and lightly assist you. As you get comfortable with the exercise, it's easy to increase its challenge by holding a weight between your ankles. Chin-ups are beneficial because of their convenience; with minimal equipment, they provide a challenging workout to several muscles.